Built in the mid-19th century, and leased from Christopher McClean by Patrick Delany Snr., presumably father of the aforementioned Patrick whose public house occupied the Barmondays site across the Square. I could find no further information on the lessor: One of my sources had a Charles and Robert McClean in Maryborough in the 1760's, another a Charles McClean, a weaver in 1813, and in a third we find William McClean of Brockley Park, Stradbally, described as a 'Sportsman' licensed to own 'one gun and two pistols'. But no sign of Christopher. The Moore family was in business here from the 1860's. Initially, Patrick and Anne, then, from the 1890's, John (Farmer and Grocer) and his wife Mary. [One of their daughters was married to Richard Plunkett Fennell, Postmaster, whose acquaintance we'll make later in this project.] 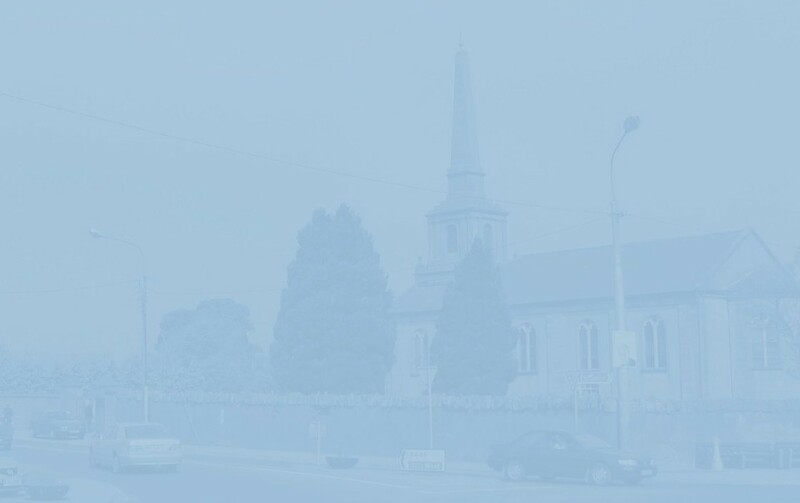 On Census night 1911, the household comprised eight people: John and Mary, their son Thomas and his wife Elizabeth, two female servants and two boarders, one a Trader (from Kilkenny), the other, a 'Dealer in China' from County Louth. Thomas (who had 'served his time' in Aird's in the Lower Square and later - until 1917 - had his own shop at 69, Main Street) and his wife Elizabeth eventually took over the business here. (Family Grocer. Tea, Wine, Spirit, Provision and Hardware Merchant. J. J. and S. Whiskey and Powers Special Gold Label my Speciality). In 1919, the Gaelic Athletic Association acquired land originally owned by the Moore family and thus the local club became one of the first in the country to own its own grounds. Over the years many improvements were carried out; the galvanise stand erected in the 1930's survived until 2002 when it was replaced by the current structure. To this day, a mild controversy still ensues over the name of O' Moore Park: should it be known as Moore Park, or is it rightly called after our county's eponymous clan? The Moores were succeeded by Patrick Conroy (1930's) and subsequently, the Fitzpatrick family (some of whom, incidentally, remember a flagstone in the backyard bearing the Moore name). Until his death in 2016, the pub was owned by Jimmy Fitzpatrick whose deep attachment to anything to do with the town was matched by his interest in the GAA. His grandfather, so the story goes, purchased this building on the same day as he sold No. 11. Known as "Big Jim, the Concrete King", he was a popular builder, responsible for houses in the New Road, O'Moore Place and Hillview. His son, Thomas, operated a sawmill at the rere of the premises which was accessed by a gate where the Fitzpatrick's private residence stands today. I was surprised by how often, more than many other features around the Square, Fitzpatrick's "great big saw" loomed in the memory of people I interviewed. 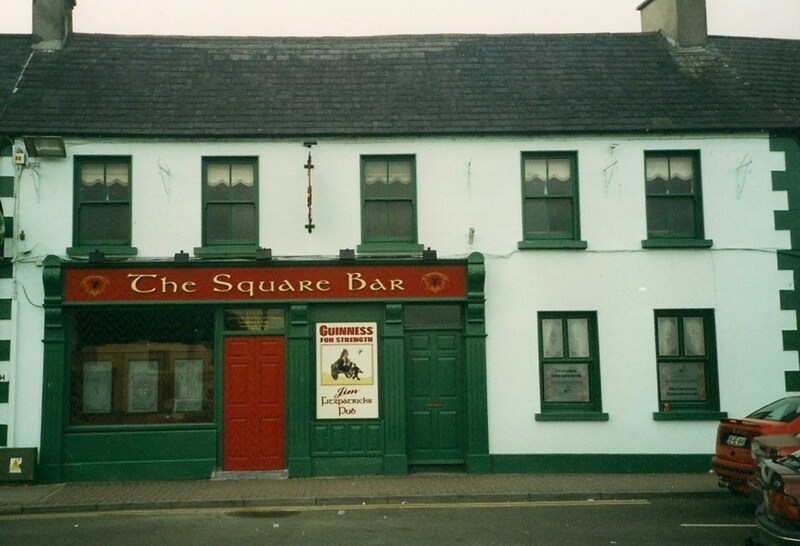 In recent years, the Square Bar was a very popular live music venue and, as such, it came as some surprise to many townspeople when it was announced that this landmark business, run by four generations of the Fitzpatrick family, would close for good on New Year's Eve 2017.